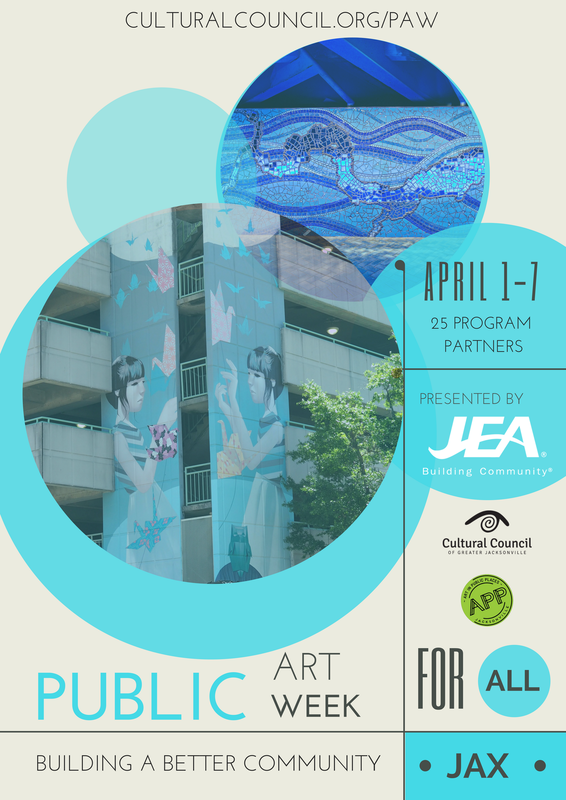 Public Art Week (PAW) is an annual, week-long initiative that celebrates Jacksonville’s public art and highlights the benefits that are created when investments are made in art that is accessible by all. 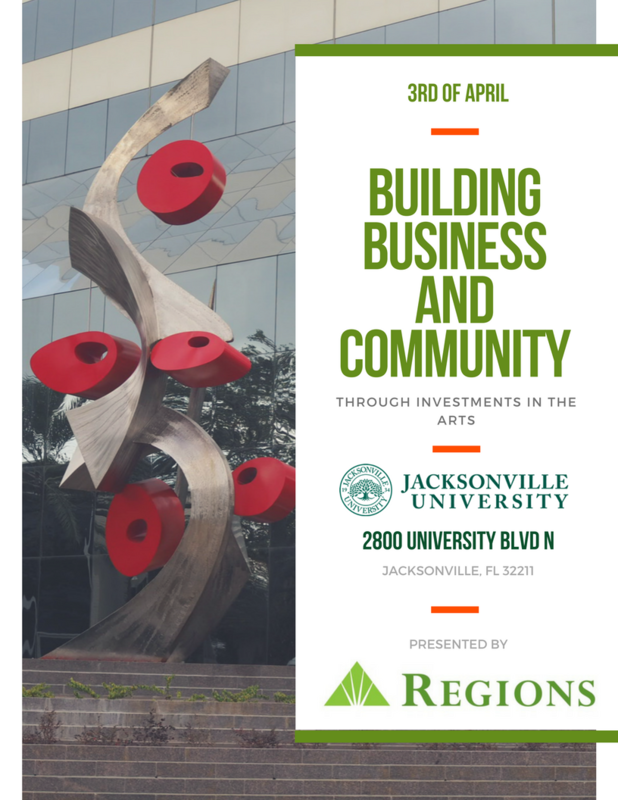 It is led by the Cultural Council of Greater Jacksonville to encourage residents and visitors to explore and engage with works of art that comprise Jacksonville’s rapidly developing artistic and creative landscape. In addition to advancing the community’s awareness of and engagement with the City of Jacksonville’s official public art collection, PAW also showcases public art initiatives led by private entities and individuals. Bring the family downtown to Hemming Park to participate in a public art mosaic project with RouxArt. RouxArt is Kate Garcia Rouh, a life-long artist and art educator in Duval County, and her husband Kenny Rouh. Their work can be found throughout Jacksonville in parks and on schools. Perhaps their most iconic piece is "Mirrored River: Where Do You See Yourself?," which is located along the South Bank of the River Walk and is in the City of Jacksonville's official public art collection. During Public Art Week 2018, RouxArt's focus will be transforming the planters located in Charlie's Cafe. You can find Kate and Kenny in the park from 11:30 AM until 1:00 PM, Monday through Friday. The community is encouraged to participate in the creative process, no prior experience required. Did you know that public art is present both inside and outside the Main Library? Some of the pieces in Art in the Public Places collection that are placed inside the library include Larry Kirkland's "Wisdom," Al Held's untitled piece, Moulton Lee Adams's "Ribault's Landing," and Kathryn Freeman's "Allegory of a Library." The Jacksonville Public Library invites you to celebrate the collection with a walking tour on Monday, April 2 starting at 12:00 PM. Special presenters will discuss the different methods used in creating art for public places and highlight works in the collection. The Phoenix Arts District is located two-miles north of downtown and is slated to be Jacksonville's next thriving arts district. Serving as the nucleus of this development is 100,000 sq. ft. of warehouse space spanning over a 4.5 acre campus. The space will be converted into a hub for Jacksonville's creative community, including workshops, studios, a café, event space, galleries, and an art education facility called the Jacksonville Florida School of the Arts. JFSOTA’s mission is to provide an immersive experience that promotes mastery of the traditional and contemporary arts. The core values are collaboration, preservation, accessibility and artistic excellence. The vision is to position Jacksonville as the leading city in the Southeast for artists to live, work, and evolve. Over the next five years, the Phoenix Arts District will hosts events that enhance the arts community in Northeast Florida, develop a working school, and raise funds for the growth and development of the District. The Phoenix Rising Festival, scheduled for March 24 and 25, will serve as an introduction to the future of the Phoenix Arts District. The focus of the festival is a mural initiative. Muralists from around the southeast region will arrive on campus with varying talents to paint the district's walls, adding vibrancy and value to the surrounding community. Over the span of one-week, these artists will bring their unique perspectives to a community in need of more art and art education. The artists will participate in engaging the community through the creation of murals, artist’s talks, and panel discussions. The lasting effects of these murals will be seen for years to come. The Phoenix Arts District invite you to a walking tour of the works completed during the festival as part of Public Art Week. 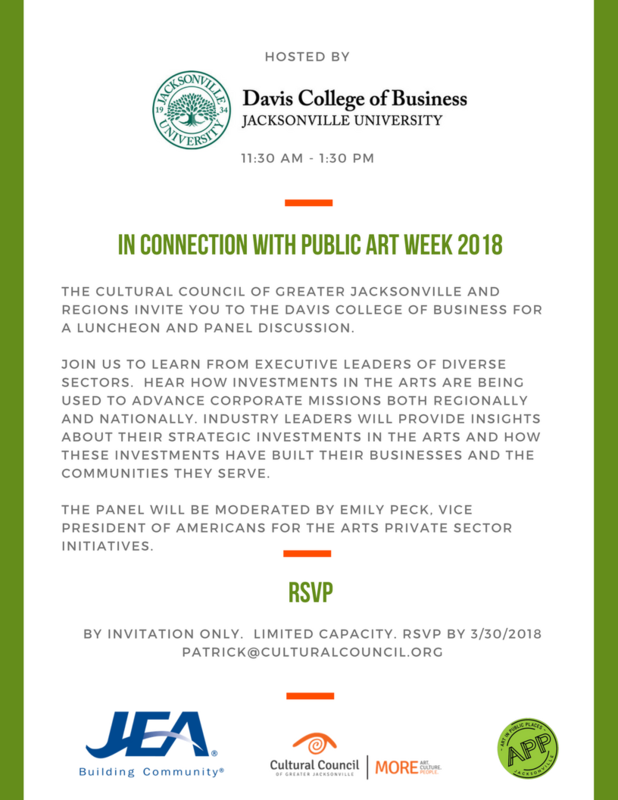 The Cultural Council of Greater Jacksonville and Regions invite Jacksonville's corporate executives to the Davis College of Business for a luncheon and panel discussion. Join us to learn from executive leaders of diverse sectors. Hear how investments in the arts are being used to advance corporate missions both regionally and nationally. Industry leaders will provide insights about their strategic investments in the arts and how these investments have built their businesses and the communities they serve. Sculpture Walk creates culture and vibrancy in the community through outdoor public sculpture. The initiative is designed to be an educational self-guided tour for families, tourists and passersby, and free and open daily to the public. The third iteration of Sculpture Walk Jacksonville is a temporary outdoor sculpture exhibition in the Springfield Historic District. The 2017-2019 exhibition features ten large-scale sculptures with the potential of up to four being purchased as permanent pieces for the community. Funding for Sculpture Walk Springfield is provided by the Florida Division of Cultural Affairs, Councilman Reginald Gaffney, Springfield Preservation and Revitalization Council, and numerous private donors. The selection committee for the 2017-2019 exhibition included the board of Sculpture Walk Jax, local art professionals, and community representatives. 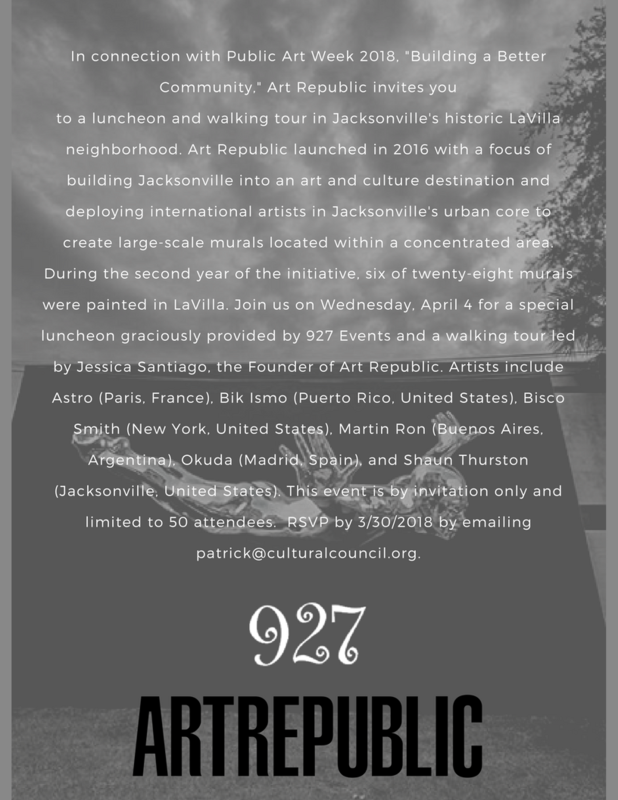 Art Republic and 927 Events are hosting a luncheon and walking tour of the Art Republic murals located in Jacksonville's historic LaVilla neighborhood. View murals created in 2017 by artists Astro (Paris, France), Bik Ismo (Puerto Rico, United States), Bisco Smith (New York, United States), Martin Ron (Buenos Aires, Argentina), Okuda (Madrid, Spain), and Shaun Thurston (Jacksonville, United States). The “Chimes Project,” a major interactive, multi-media art and education initiative, now under construction in Hayling Freedom Park, is being undertaken by Compassionate St. Augustine, the City of St. Augustine, and the grassroots organization Keep Riberia Pointe Green. As the Ancient City’s first officially approved permanent public art installation, it will interpretively pay tribute to our city’s Civil Rights and historical African–American storylines as well as the roles freedom, human rights, democracy, tolerance, civility, and compassion played in creating the narrative. The core values of the Chimes Project are grounded in the teachings of Rev. Dr. Martin Luther King. Sculptor Joe Segal is crafting a marble arc for the memorial. Segal's contribution is titled "Towards." The title derives from Dr. King's quote, "...the arc of the moral universe is long, but it bends toward justice.” April 4th is the 50th anniversary of the assassination of Dr. King. Description:In connection with "Writing On the Walls: Visual Literacy Through Street Art Culture," the Jacksonville Public Library invites you to the Jax Makerspace to learn more about hip hop's influence on street culture. Join beatmasters and music production enthusiasts Willie Evans Jr., Paten Locke, and Avant Arts as they curate a conversation about hip-hop. There will be live demos, scratching, and your favorite local DJs playing iconic hip-hop through the decades. You can get in the producer's seat by making your own beats with our Audiotools program. WJCT Generation Listen is partnering with the Cultural Council of Greater Jacksonville for a free public art-themed listening party. Join us Wednesday, April 4 from 6:30- 8:30 p.m. at WJCT Studios for public radio pieces followed by discussion related to public art. Complimentary snacks and drinks will be provided. Led by WJCT's Lindsey Kilbride and Brad Stephenson, as well as Cory Driscol, a member of the Art in Public Places Committee. On many different levels, affordable, quality housing has a significant impact on the revitalization of a neighborhood. Quality housing improves the designs and aesthetics of a neighborhood, removes slum and blighted conditions, increases property values, provides an appreciating asset to families, and is a conduit for market forces to invest in a neighborhood. Housing development is also a visual sign to neighbors and the community that something new and exciting is happening. Northwest Jacksonville Community Development Corporation (NJCDC) has built a total of 90 homes, mainly in the greater 29th and Chase Neighborhood, with 11 more currently in construction. These homes were built on in-fill lots, vacant lots, or lots where condemned houses created slum and blight conditions. The physical transformation of the community helps with overall pride and re-investment by existing area stakeholders. When new homes are built, property owners of existing neighboring homes improve their properties as well. Branding the community in a positive way and implementing public art projects is a way to build a sense of place for neighborhood residents. It can also influence how those outside of these communities view this region of Greater Jacksonville. Renewed Community Initiatives (RECi) has received a grant to fund several small scale beautification projects in the Harborview neighborhood of Jacksonville. The project will illustrate that small changes can make big differences. One project that is slated to be funded from this grant is a mural located on the west facing wall of Mr. K's Bar-B-Que and Seafood, located at 4906 Soutel Drive, Jacksonville, FL 32208. The Community Pride mural will be the first of it's kind in the neighborhood. Council Member Reginald Brown has also been working with Art in Public Places to place two additional pieces of public art at two separate sites in the area, one at Legends Community Center and the other near Ribault High School. Coordinated by Tracie Thornton, an artist, community advocate, and member of the Art in Public Places Committee, RECi has worked over the past year on efforts to beautify Harborview and surrounding areas, educate the community about available city resources, and the power of neighborhood solidarity. The grassroots organization focuses on the transformation of even the smallest of spaces into positive places through the use of art and placemaking. RECi invites the public to an information session on Thursday, April 5 at 12:00 PM. This is a great opportunity for the community, artists, and supporters to learn more about the project and its timeline. The general public can contribute to help fund the project and artists can submit their qualifications to be considered as muralists for the project. Test your skills of observation at the Jacksonville Public Library with a game that highlights the differences and similarities of artwork in public places. Tony Allegretti, Executive Director of the Cultural Council of Greater Jacksonville, and Shawana Brooks, Arts and Culture Developer at the Jax Makerspace, will co-host and serve as quizmasters. The Cultural Council periodically posts Calls to Artists for local and national opportunities. When these calls are specific to Art in Public Places initiatives, the Call requests that interested candidates respond by submitting their qualifications. This is a standard part of the process when the City commissions art pieces to be add to their permanent public art collection. This participatory session provides attendees with the opportunity to learn more about the process, including how local businesses and agencies enhance the projects. Attendees will have the opportunity to ask specific questions about the process and any current opportunities. 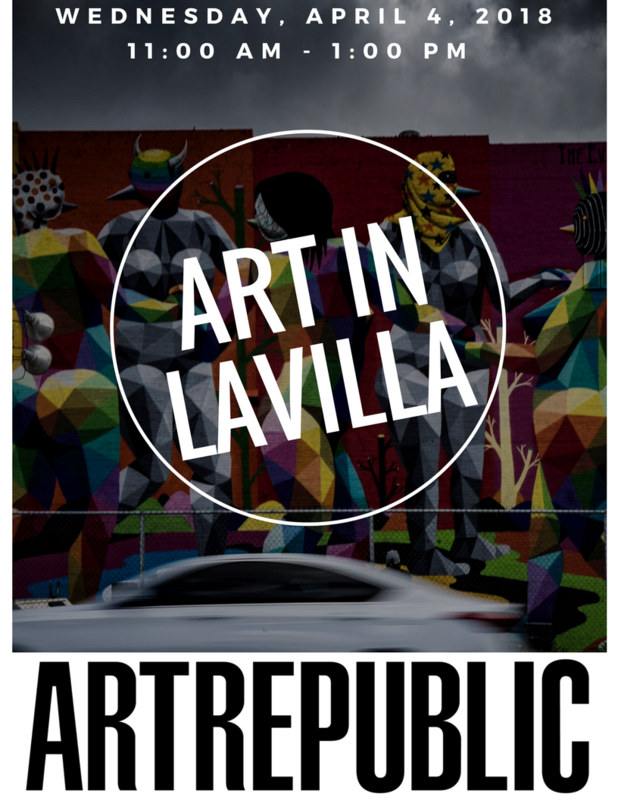 This information session is tailored to anyone who has an interest in learning how public art happens in Jacksonville or an interest in pursuing a career as a public artist. We invite you to join Art in Public Places Staff, experienced public artists, Art in Public Places Committee members and others representing integral components of the public art process to learn how public art happens. The Jacksonville Cultural Development Corporation invites you to join them on Friday, April 6 at 11:00 AM when they dedicate the "Local and Legends" mural created by artist Suzanne Pickett, Marsha Hatcher, Annelies Dykgraaf, and the Groundwork Jacksonville 2017 Greenteam. The mural honors legendary Asa Phillip Randolph, Zora Neal Hurston, James Weldon Johnson, Bob Hayes and A.L.Lewis and locals, Clarence Williams, and Pearlie Graham. Speech Recital from ASA, James and or A. L.
Join Hemming Park for lunch live music in the Park. This is part of the TGIF Concert Series, which occurs every Friday from 11:30 am until 2 pm. April 6th's musical act will be Bridgewater, Carter, Davis Trio. The band brings high octane, bluesy funk straight outta Jacksonville's Northside. ​Public art is site specific and easily accessible. It enriches Jacksonville’s landscape and becomes part of a visual narrative depicting the city’s culture, people, neighborhoods, history, and natural beauty. A concentrated number of public artworks at varying scales and media can be found throughout Jacksonville’s urban core and integrated into architecture, city parks, public buildings, and streetscapes. It is found in the form of sculptures, murals, mosaics, monuments, fountains, street furnishings, and even photography collections. Art in Public Places and others will lead free public art walking tours to showcase Jacksonville’s diverse public art collection and its impact on revitalizing the downtown urban core at the street level. Participants will explore a variety of public artworks created from both public and private initiatives. Each work, permanent or temporary, illustrates the city’s rapidly growing public art collection. The University of North Florida (UNF) Center for Urban Education and Policy (CUEP) had developed a student-driven public art project in collaboration with local civil rights activist Rodney L. Hurst Sr. and others community members and leaders of the Historic Eastside. Artwork will be created by high school students and guided by regional artists in an educative, historically significant community-based learning experience we are calling, Hope and History Mural Project (HHMP): Learning from Our Past to Lead into Our Futures. The goals of the project are to help youth create positive connections in the community, learn about a significant local historical event in which youth helped bring about social and community change; become more familiar with important local organizations, including the Ritz Museum, Jacksonville City Council, and University of North Florida; and learn lessons in art, architecture, and science. Hemming Park invites you downtown for a dedication and celebration of public art. The event will include food trucks and a cash bar, as well as live music with The Space Heaters, whose roots are in rock, jam, funk, and experimental roots. Artist vendors are also invited to participate in this event by exhibiting their work for sale. Student artist from James Weldon Johnson Middle School, alongside their art teacher, Amanda Holloway, are collaborating with artists Nadia Ramoutar, Roosevelt Watson, Scotty Briggs, and Ryan McNair to create a public art project on the facade of Knopf & Sons Bindery. The project is called "Dream Big: A First Flight to Mars Mural Project." Once finished, this community project will add vibrancy to the Lower East Side while also serving as encouragement for girls and children of color to pursue careers in science, mathematics, technology, and engineering. Murray Hill Preservation Association invite you to participate in the Murray Hill Mural Festival on Saturday, April 7, 2018. Visit Jacksonville's charming neighborhood and meet the muralists responsible for creating the murals found along Edgewood Avenue. This family-friendly event will include mural walking tours, vendors, and food and drink from local establishments. ​Join Groundwork Jacksonville, RouxArt and neighborhood residents for a fun-filled afternoon of art making and community building. The Sugar Hill mosaic is a year-long mosaic project that is being produced through a series of community workshops. The mosaic design incorporates Sugar Hill's past, present, and future. Together, we are honoring this neighborhood's history and engaging community members to define the neighborhood's present and future growth and revitalization. Community workshops are open to anyone regardless of artistic skill level or age. Southeast Sister Cities Reading Tour was formed by several literary artists who live and work in Northeast Florida. Through this initiative, a small group of writers are selected to travel to other cities in Florida and represent Jacksonville by conducting live readings of their works in public settings. The inaugural tour occurred on March 31 when the group traveled to St. Pete. Jacksonville returns the favor on Saturday, April 7 by welcoming a group of five writers from St. Pete as part of Public Art Week. Mark your calendars for the inaugural Jacksonville Lantern Parade, an illuminated celebration of creativity, art, children, and the St. Johns River. 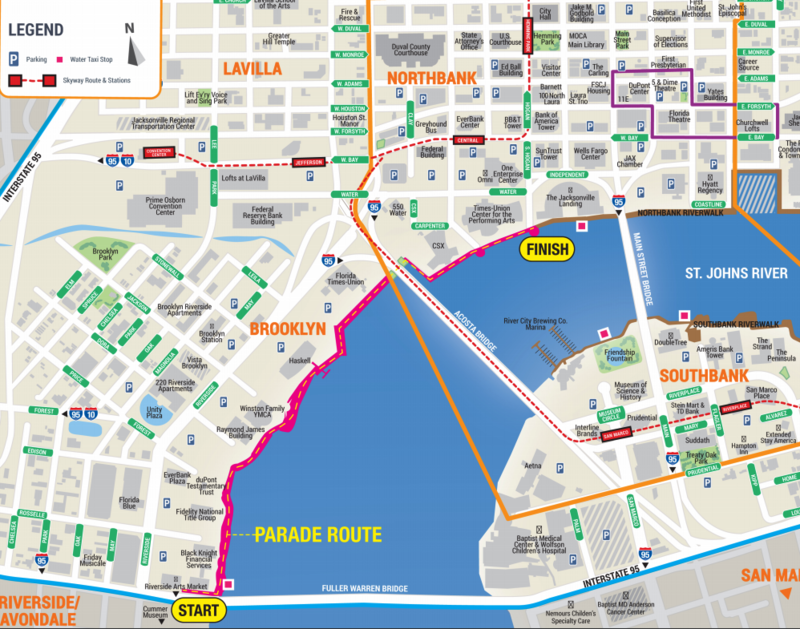 The Parade will be a glowing procession of light, color and music that will illuminate the city skyline and the St. Johns River the evening of Saturday, April 7, 2018. A combination temporary art installation, family friendly celebration and fundraiser, the parade will shine a light on the creative and kind heart of our beautiful city in a whole new way. The mission of the parade is to support Jacksonville area arts education by creating a fund that will purchase much-needed art supplies such as paints, brushes, pastels, paper and other expendable materials on an annual basis. In addition, the fund's charitable initiative includes purchasing more permanent art equipment such as pottery kilns and professional easels, specifically earmarked for the Duval County Public School System. Pursuant to the American with Disabilities Act, accommodations for persons with disabilities are available upon request. Please allow 1-2 business days notification to process; last minute requests will be accepted, but may not be possible to fulfill.